9 Mar 2015: For some weeks now, I have been working on building a solar dehydrator. This is far too big for my garden, but it is being built in my garden and will be transported to Woodbro', to the organic farm (PIP) of John Macdonald. 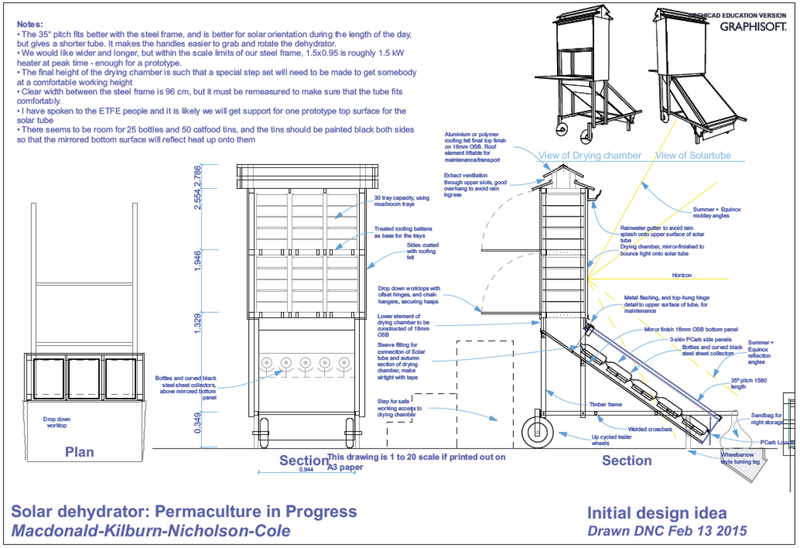 The whole device stands 3 m high and is designed for drying out herbs and tomatoes. As the solar tube warms up it draws in from the bottom louvre and that rises up through the drying chamber and out through the roof. As the air rises it passes through as many as 30 perforated trays which can contain herb leaves or drying fruit or drying tomatoes and then exit through the roof. In this image, it is fully modelled in ArchiCAD and GDL and is being built precisely according to the model, And if I make small on-site variations in the real thing, I go back to the model and make sure that it represents fully the final object. This will be on a turntable so that it can be rotated to track the sun. The folding mirror will ensure that maximum sunlight enters the solar tube. The tube will contain black painted absorbers of thermal mass phase change wax (Rubitherm) which will cool the tube in hot weather and produce warmth when the sky is grey or the sun has set. The top panel of the solar tube is designed to be an ETFE panel which we are hoping to get from Holscot or Evolve. Holscot kindly donated the front panels for my Surya 3 solar panels. The improved performance of my solar Sunbox has proved the efficacy of ETFE in a solar thermal panel. Below is an early 2D drawing of the design, but it has since been 3D modelled, down to the last bolt and bracket, and the final 2D drawings for construction are taken from the model. I have taken progress photos during the construction and will post a fuller set as a different article in the blog. Interesting. 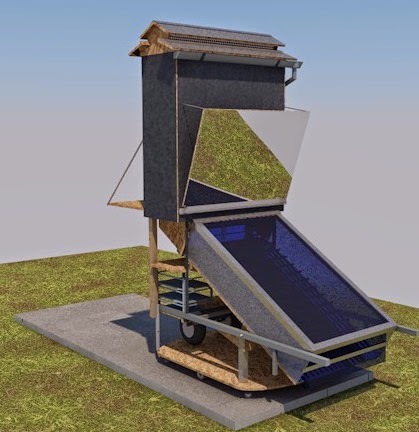 Did you build that solar dehydrator? If yes how it comes out? It was finished and it was perfect, but the ungrateful farmer for whom I built it never used it as far as I know.